Tiger Roars and Lakers Limp! So by now, we all know the deal! 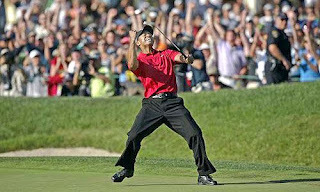 Tiger Woods roared to victory in the U.S. Open and the LA Lakers crumbled in Boston. I'm not sure we're aware of all of the consequences of this weekend of great sports but we do know that Tiger is scheduled to take the rest of the golf season off. So that means he will be absent from the British Open, the PGA Championship, and the Ryder Cup. 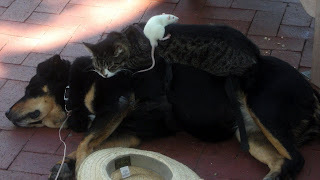 Perhaps the other competitors are chomping at the bit and eyeing a possible victory. Clearly Tiger's absence will mean more money for the pool and a big loss for the true Tiger fans. As a spectator, I literally sat at the edge of my seat and enjoyed every aspect of the competition. I'm a golfer and I enjoy playing the game but let's be real! Usually watching a round of golf is quite boring. Unless of course, you can make the impossible - possible! I think that's what happened last weekend! Many lucky viewers had the opportunity to enjoy a great competitive round and watch two golfers go at it with the fury of two bulls in a ring! Tiger, made some unbelievable shots to stay in it and won over many fans for the future. 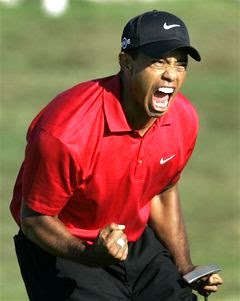 Spectators from here on out will be glued to Tiger knowing that he in fact can make the impossible happen. Another part of this great story in my opinion is Mr Rocco Mediate. Rocco, equally is part of this great story! Pretty much leading the entire tournament, he battled the charging Tiger at every stroke. When Tiger made two incredible eagles to take the lead, Rocco maintained his composure and rallied for a great performance on Sunday. As he watched from the clubhouse on Sunday, he joined many in the world as we collectively witnessed yet another impossible feat by Tiger Woods. Woods dropped the put at hole number 18 to send this US Open into an 18 hole playoff on Monday! Unbelievable! But still again, Rocco put his game face on and came to play. His effort fell a little bit short and the victory obviously went to Tiger but as a spectator and fellow golfer, I enjoyed the spirit that Rocco, at 45 years old, brought with him to Torrey Pines. His laughter and competition were welcomed. My hat is off to both of these golfers for bringing all of us an entertaining round and an event that will be relished by golfers and non-golfers alike for many years. On the other hand, the Los Angeles Lakers were issued a good old fashioned spanking in Boston! The Celtics just had too many weapons and simply out-played the Lakers. Oh well, there's always next season. What's with the number 100? And why does it seem to have such an appeal? 100% of something means everything! All of it! I suppose if you're getting all of something good, that could be a good thing. If you scored 100 on your History exam you'd be happy! If you got 100% wrong, you might be a bit sad. If you broke 100 on your golf score..... Well, it depends on your level of play I suppose. What about if I gave you a cold, crisp, 100 dollar bill - would that make you smile? Here you go! Oh, you mean you wanted the real thing huh? What would you do with the money. Frankly, $100 isn't what it used to be. But on the other hand, there are many people in this world who live off of less than 2 dollars a day according to the World Bank! The World Bank defines extreme poverty as living on less than 1 US dollar per day, and moderate poverty as less than $2 a day, estimating that "in 2001, 1.1 billion people had consumption levels below $1 a day and 2.7 billion lived on less than $2 a day. That's 3.8 billion people living on less than the cost of a Starbucks Latte per day. So in theory, $100 could provide support to someone living in moderate poverty for about 50 days! So as I acknowledge my 100th post! Hooray! I wanted to do something more than just shout hooray and pat myself on the shoulder. I've decided to make a contribution to a charity. I decided to make it a charity that I rarely support. In this case, I've chosen World Vision I'm not necessarily endorsing this charity over any others. Please do your own research if you choose to make a donation. But ultimately, I do hope my contribution will make a difference. Many of you have already reached and exceeded the 100 mark. My compliments to you. I now know what a commitment it really is to write and post this many times. I've enjoyed it and hope I can continue to the 1000 level! Drains Two Long Puts To Take The Lead. Tiger sets his sights on his third U.S. Open victory tomorrow. Today, with 6 holes left, Tiger was 5 shots behind the leader. He went on to post 2 Eagles and 1 Birdie to take the lead. Sore knee and all. A while back I posted "Eat This Not That." where I rambled on about a few things and ended with a question on whether you should eat a Tuna Sub or Roast Beef Sub. Today I've got another dilemma for you.... How many of you are cookie eaters? If you like cookies, then I'm sure you've had the chance to sample one or two at Subway. What about Doubletree Hotels? Have you tried their cookies? This past week I found myself in a position to enjoy cookies from both Subway and Doubletree. So out of curiosity, I decided to check out the details. I couldn't find a comparison for these cookies on the "Eat This Not That!" site. But for other cookies, follow the link. Subway Cookies- Last week I went for the three for $0.99 special. I opted for one of each of the CHOCOLATE CHUNK, WHITE CHIP MACADAMIA NUT, and PEANUT BUTTER. Believe it or not, I only ate the Chocolate Chunk. I may get around to the others later. 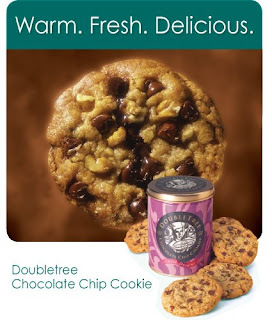 (smile) But for now, I'll just compare the Chocolate Chunk to the Doubletree Cookie. Now for some more news. The Subway cookies weigh in at about 1.5 ounces while the Doubletree cookies tip the scale at close to 2.3 ounces. So the DT cookie is a bit larger. If you look at the numbers and you compare one cookie to one cookie, it appears that the Subway cookie would be the best bet. Guess what? You're probably right but I'm going for the Doubletree Cookie every time! They are absolutely delicious! Made with Ghirardelli chocolate chips and walnuts, I think they are scrumptious. I'll be happy to run a few extra miles or spend some extra time in the gym but keep those warm cookies coming! Perhaps it's the special chocolate, or the walnuts, butter, or the cinnamon. But I love them! Good thing I only have them about twice a year. Unfortunately, I've just located a recipe on line. I think I'll try to make a batch. If you like em too..... Here's the link for the recipe: Doubletree Cookie Recipe. I spent the weekend in Santa Barbara, California. I took my laptop but managed to go the entire weekend without using it once. I didn't post, read blogs, surf the web, or check one single email. Oddly enough, the world did not melt at my feet as a result of my failure to do so. It's funny how that works. Things usually manage to go forward without my meager input. And believe it or not, I didn't miss anything important. It was a clear weekend and the temperature reading in my car showed 68 degrees -72 degrees for most of the time. The clear skies and bright sun made the temperature seem hotter. The slight breeze had a nice cooling effect but standing around in the sun proved to be quite warm. The nights were pleasant, cool, and refreshing. It was really a nice experience. "Left at Albuquerque." located at 700 State Street in Santa Barbara. The atmosphere and dress are casual. If you go there, try the fish tacos.... They were good. The house salsa, served with colorful chips, left a bit to be desired. I found it to be really plain and somewhat tasteless. Not the way I like it. I asked the waitress (her service was great and the gratuity reflected it) for some jalapenos to "kick it up" a bit. That seemed to do the trick. After that, I needed something to put out the fire in my mouth so I bypassed the traditional margarita and went for their seasonal beer instead. It was a Sam Adams - Summer Blond Ale - I believe. It was Supreme! It was served in a frosted "Miller Lite" glass with the Los Angeles Lakers logo on it. A really cool glass but probably an etiquette blunder in the eyes of good ole Sam. I overlooked the Miller Lite logo, not that I have anything against Miller, and enjoyed the awesome beer in spite of the oversight. It was quite nice after a morning in the sun and a touch of sunburn on the back of my neck. The bar area was lively and had a wide screen plasma television and they were showing the Belmont Stakes. 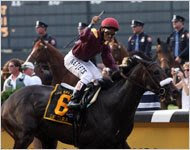 As you probably know, Da' Tara, a 38-1 long shot, shocked the field and took home a victory while Big Brown disappointed and failed to be anointed as the 12th Triple Crown champion. So armed with this new insight, motivated by this revolutionary philosophy, and refreshed from my weekend break, I'm now off to conquer the world! May you all be equally moved! Big Game tonight! The Lakers, down two games to none, return to their home court tonight to battle the Boston Celtics. Guess what? The Lakers came to play! A team effort led to a Lakers victory. Let's see what's in store for us in game 4 Thursday night. 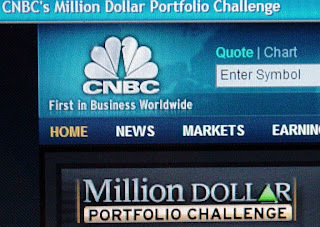 Million Dollar Portfolio Challenge Update! It looks like I'll be losing some ground following the market close today. Many of my holdings have gone down in today's trading.